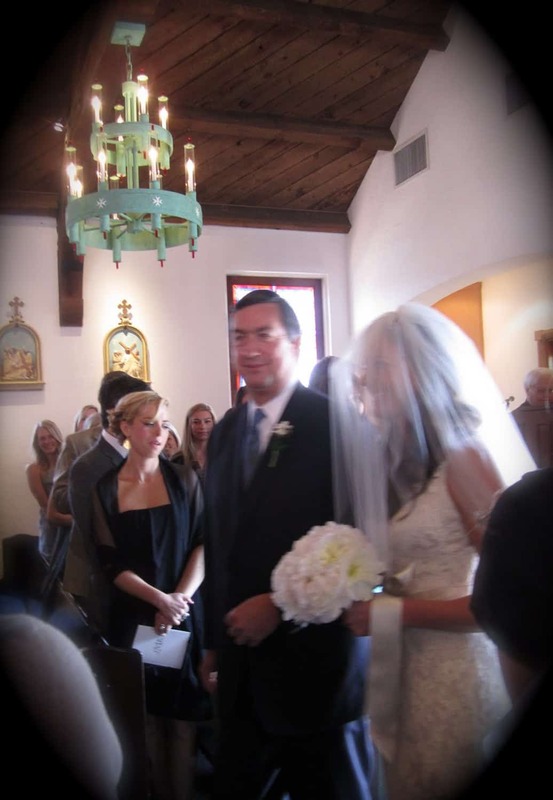 My friend, Claire’s daughter, was married last Saturday. 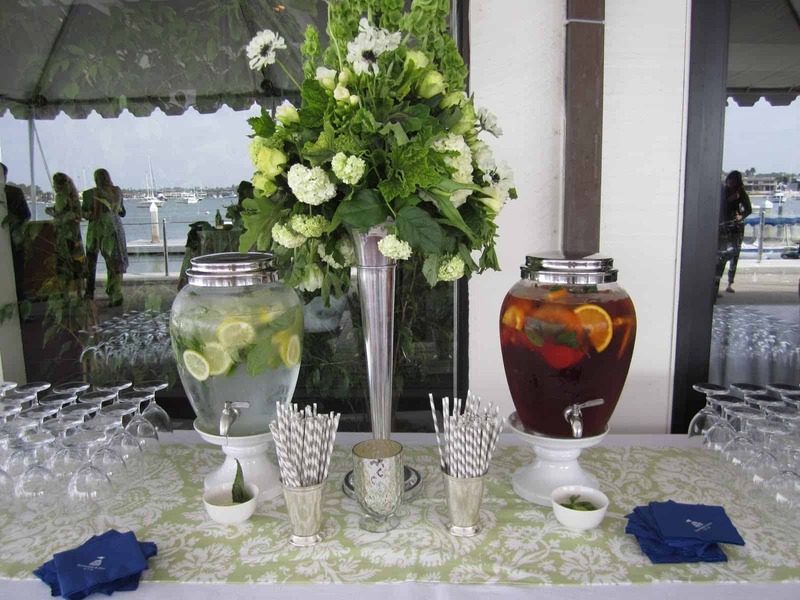 Many thoughtful details were evident at the party at the Newport Harbor Yacht Club. 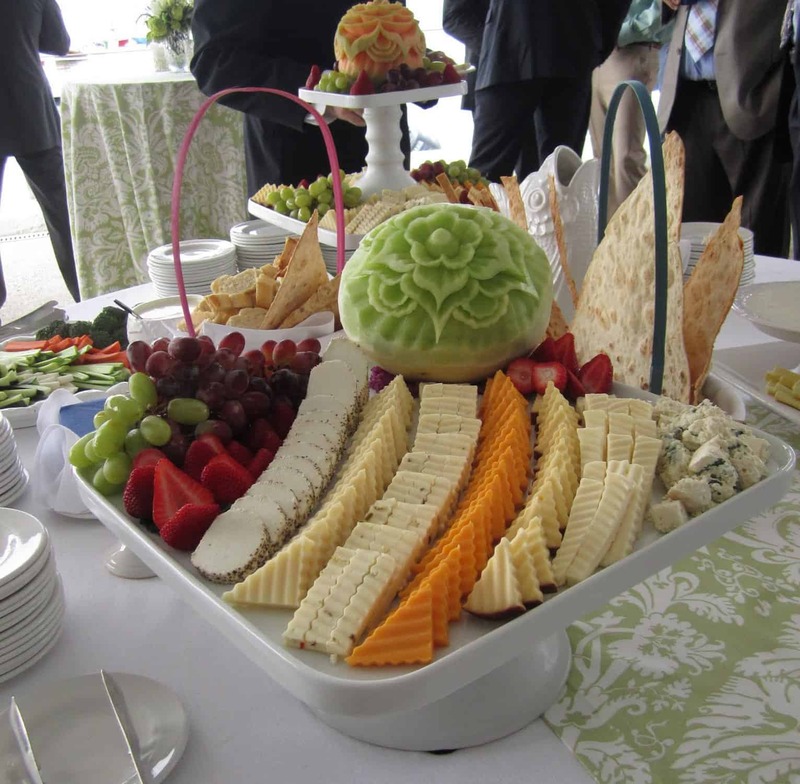 (You may remember Katherine’s bridal shower from this post and this post. ). JMK monogram on the sign above and below? 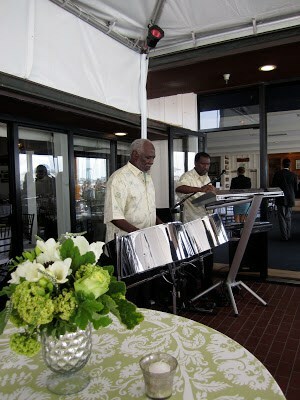 We started with cocktails and appetizers on the patio overlooking the bay. You can see the harbor in the window reflection. The straws are a pretty touch. chapel on Balboa Island (below). Inside each hand calligraphied envelope was the guest’s table number. 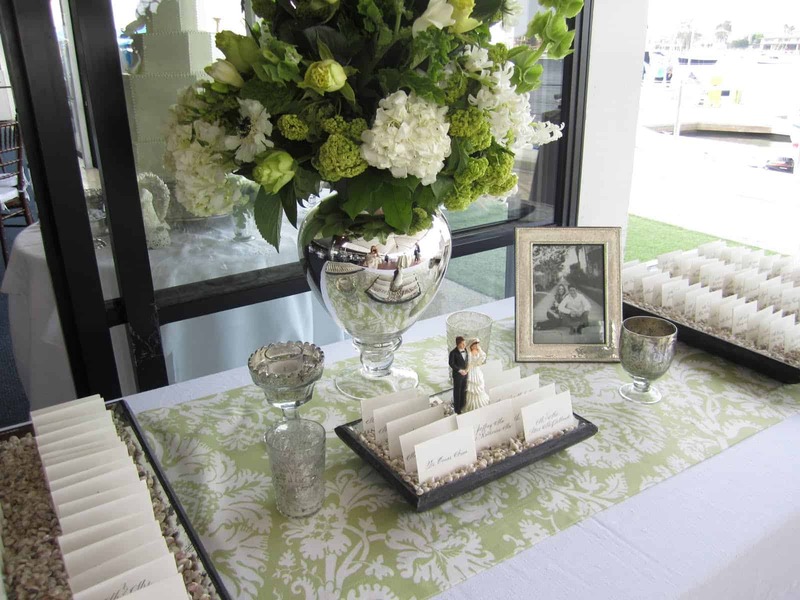 The envelopes were alphabetized and placed in trays lined with pearl shells. The décor included silver and mercury glass vases and votives. Claire also provided little touches like Jo Malone hand soap in the restroom. The beautiful angular cake with the monogram and fresh blossoms. 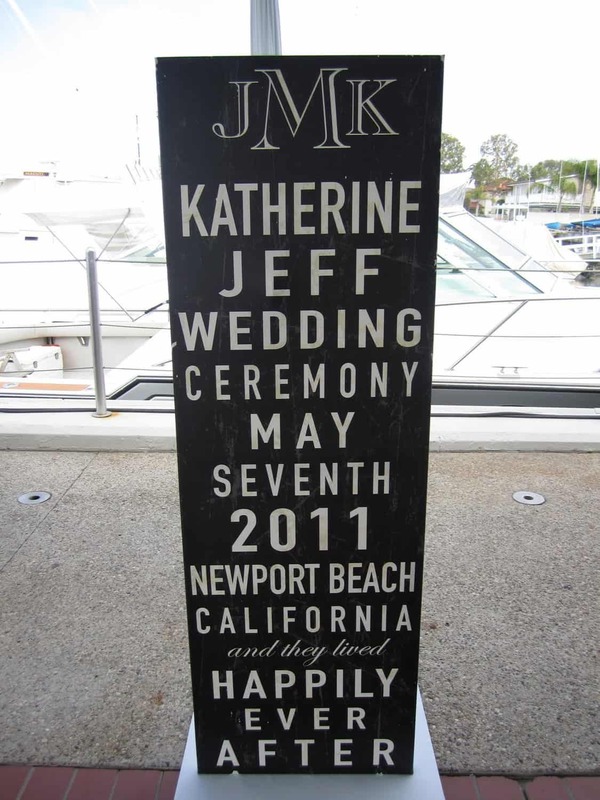 Katherine’s grandmother’s wedding cake topper is along side. my husband was actually pulling me (instead of the other way around) onto the dance floor. Thank you, Claire, Dwight, Katherine and Jeff for a beautiful experience. (and it was Mother’s Day), she delivered the above centerpiece to my home. Our home is being feature on Open House Party. Thanks Sherry. That looked like a gorgeous wedding. I love the green fabric & mercury glass!! Love all the details. 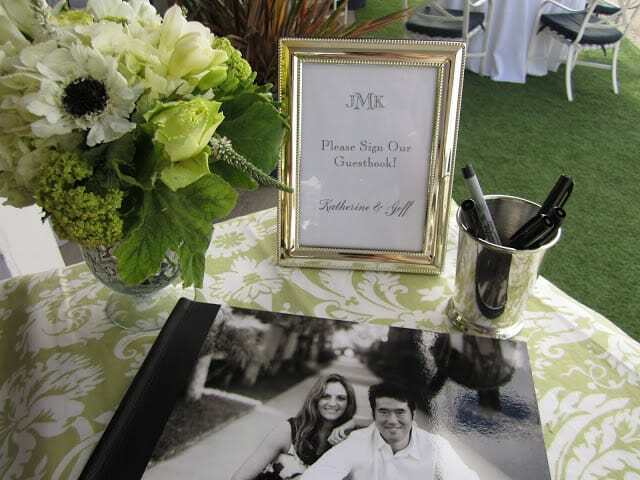 The silver beaded frame, photo book, monogram, mirrored vase, damask print, pure white, beautifully decorated crudite, silver and white paper straws and the flowers are gorgeous. What a Beautiful Spring Wedding Reception! So so crisp and inviting..
Great job on the photos! I loved the shells holding the place cards! Such a beautiful classic wedding. What a spectacular wedding!!! 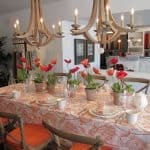 Love the color scheme, and might I say your daughter and son in law are quite the good looking pair? That cake is GORGEOUS!!!!!!! LOVE it!!!! 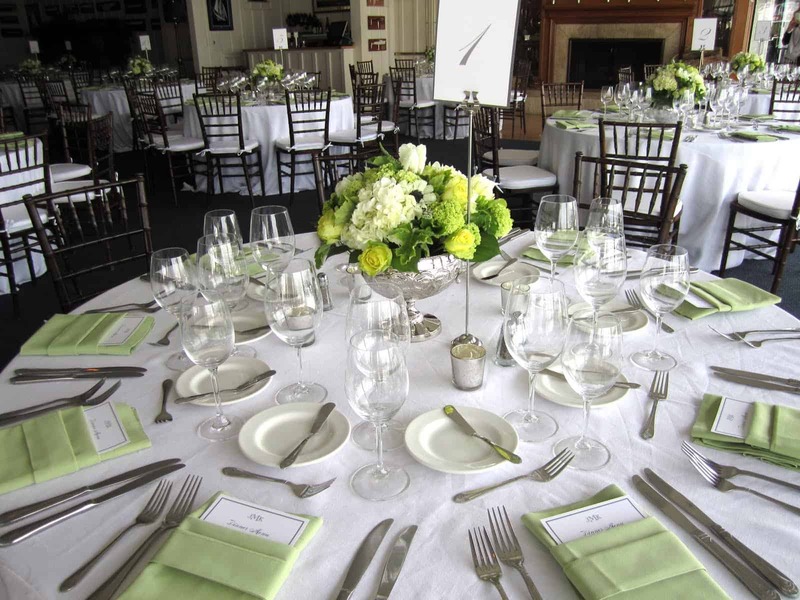 The entire wedding you can see is so classy and beautifully done….looks like a great time was had by all. A huge congratulations to your entire family!! Also stop by..doing a great giveway for a beautiful chic bench! What a beautiful wedding! Love the color palette! So pretty! Love the seat envelopes placed in the tray of shells! I'm sending this link to my cousin who's marrying this July. So many great ideas! Thanks for sharing. This was just lovely! So many pretty details that are magazine worthy! Thanks for sharing your photos with us! Absolutely gorgeous! But after that bridal shower it comes as no surprise that this is a gal with style and class. 🙂 I love the linens and just how fresh and crisp everything looks. Thanks for sharing these with us! So very beautiful. Claire has great taste! Gorgeous and classic! 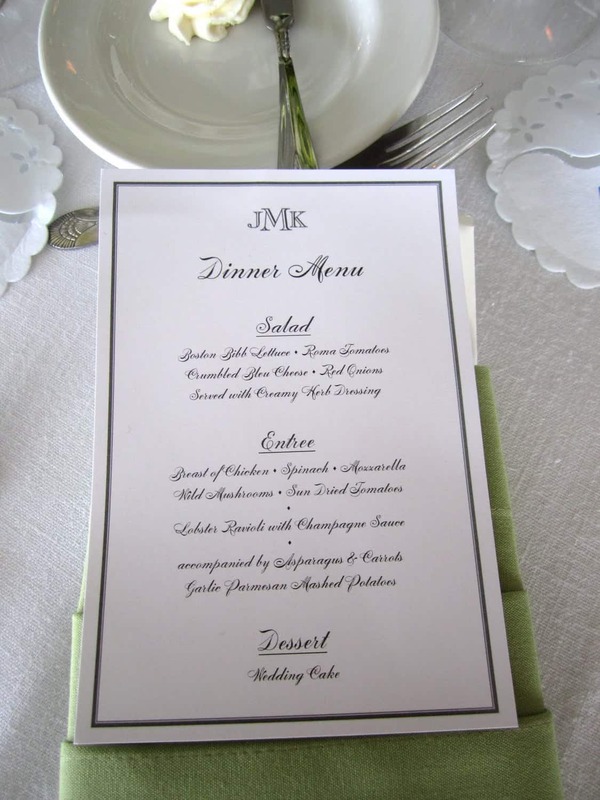 Love the soft colors and creativity of the repeating monogram, the fine calligraphy, the setting… all just perfect! How wonderful that you could transport us there with your photos. What a beautiful wedding! Thanks so much for sharing it with us. Everything looked beautiful as did the bride and groom. I am glad you had a good time! WOW!!! What a gorgeous wedding! Everything is simply elegant!! I love how they incorporated her Mother's cake topper! How special. Thanks for sharing all the little details with us! Beautiful! I love looking at wedding photos. This was a real treat. Thanks for sharing! What a gorgeous wedding! I especially loved the cards in the trays of shells…little details like that really make the event memorable! What a pretty place and looks like the nicest details were thought of. Perfection …and the lime green is so fun! Looks like it was a beautiful event with a lot of attention to detail. Love it. So lovely Mary Ann. I really love the table settings. Oh, my…what a beautiful wedding. Everything was so elegant and lovely. The details were awesome. 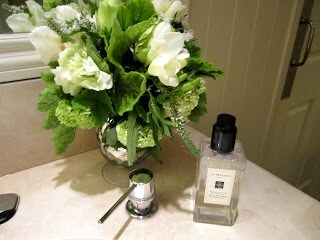 I love your pretty blog and the photos of your home on Sherry's blog just took my breath away. Wow how beautiful and some lovely special touches too. Hugs and wishes for a day filled with Happy! What a truly beautiful event!! Every detail was exquisitely thought out. And I love their unusual tailored cake!! Best wishes to the handsome couple! There wasn't a single detail overlooked. It sounds like a really magical night for the beautiful couple to start their new lives together. Simply stunning. Thanks for sharing. M.
That was a beautiful wedding….so much attention to detail….but classic and elegant. I love that they incorporated the Grandmother's cake topper! Beautiful party. 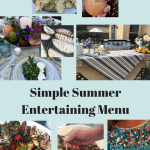 Stopping by from the Simple Pleasures Link Party. Understated elegance, my favorite style!!! The colors were also a fav of mine, just beautifully done!! I saw your home over at Sherry's everything looked wonderful. 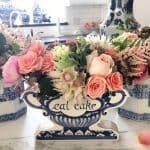 It is so fun to see your own home on another blog, isn't it? Almost like it is someone elses and you are viewing it for the first time. Enjoy!!! Happy to be following you! What a gorgeous wedding! I love all the details – especially the place cards in the shells and the steel drum band! Now why didn't I ever think of that..just brilliant! I feel like asking my husband if he wants to renew our vows so we can plan a beautiful event like that. Wow! What a dream wedding! Everything looks perfect! love the wedding decoration, and those photos are absolutely gorgeous! I love your blog. i'm so happy to have met you. A confession. 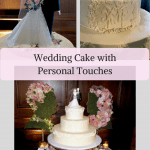 I'm not a fan of big, fancy weddings, but this one is lovely and attending such an affair could fall into the category of "simple pleasures," so thanks for linking up today. I'm planning my wedding for August this year. Thanks for the inspiration!! I just love that gorgeous cake. Wow, this looks so amazingly beautiful! What a perfect celebration. I love all the little thoughtful touches, especially all the monogrammed details. Oh my gosh how gorgeous. I love all the little details. How sweet is the bride's grandparent's cake topper next to the cake? 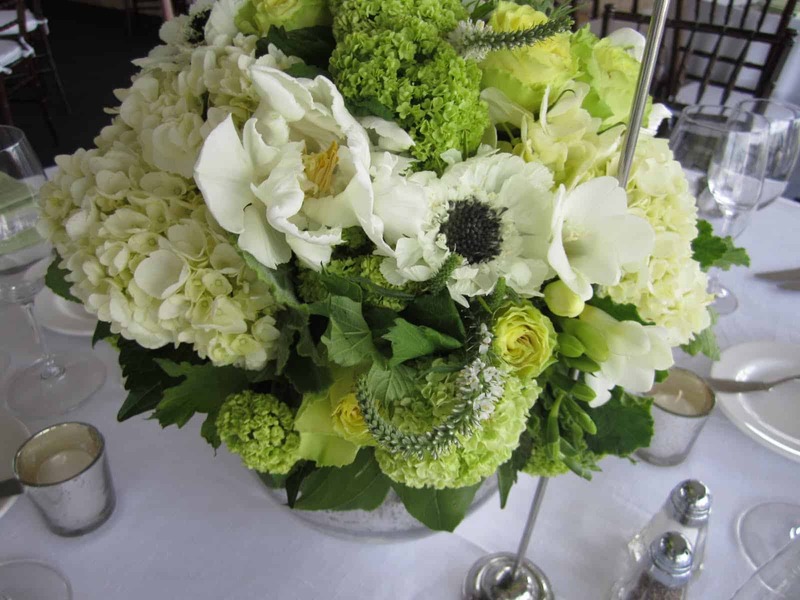 The flowers are so pretty and I love the menu at each place setting….I think that is such a lovely touch and momento for each guest to take home to remember the day. Thanks of sharing Mary Ann! 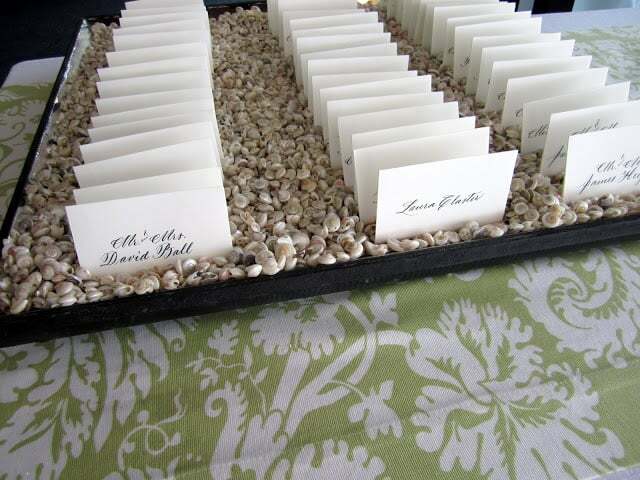 Looked like a lovely wedding…love the use of the shells with the place cards! 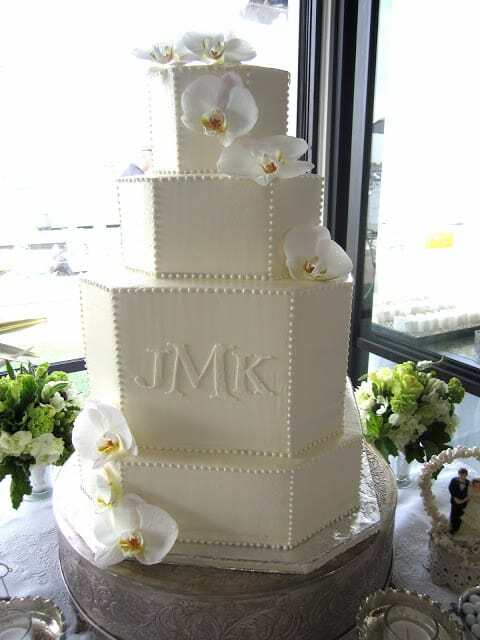 I love monograms and the cake design was to die for! 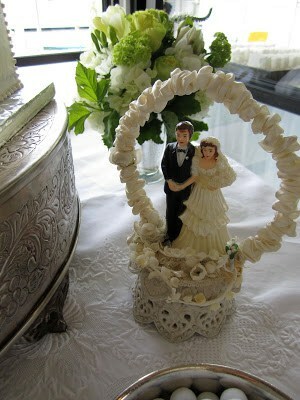 Did she add the shell details to her grandmother's cake topper or was that original? Precious. D'une elegance parfaite! bravo to the family along with best wishes and great post Mary Anne. It looked like a beautiful wedding. Love the wedding cake. Thanks for adding your link to Beach Cottage Good Life Wednesdays. What a gorgeous wedding! I love the simplicity and thoughtful details. That cake is fabulous! 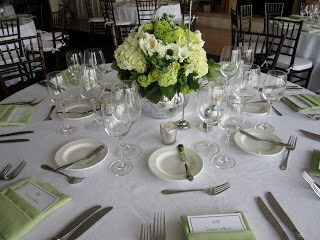 Beautiful table top decor. I must save this for inspiration for my children's wedddings some day. Thanks for your thoughtful comments on my blog! What an amazing wedding reception. The cake looked delicious! What gorgeous pictures! Everything is stunning. 🙂 Found your blog from Hooked on Houses. Good stuff! The wedding décor was quite lovely! Chartreuse mixed with shades of white happens to be my favorite. There's a quite sophistication created by that combo. Thanks for linking to the party. I enjoy having you participate.